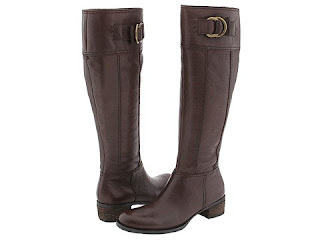 I did some damage today, and it all started with an appointment at the Clinique counter at Nordstroms (I spent way too much), lingered through lunch at the Nordstrom's Cafe, and then ended with -- wait for it -- the perfect pair of riding boots. (Okay, it didn't end there per se.) After I bought said riding boots, I had to go out and buy a couple pairs of skinny jeans in different washes to wear with the boots. And a couple long and lean sweaters to complement the boots. And then, of course, I had to buy a couple chunky cocktail rings because I love gaudy jewelry, and the "big ring" fad is so timeless. But I digress. My trip pivoted on the pair of highly coveted riding boots I found, and here's why. Last year about this time I was on the prowl for dark brown leather riding boots -- ones that were sophisticated, tasteful and feminine, with a tinge of English dressage to their aura. Aside from the obviously unaffordable $500 pair I wanted, the best I could find was a pair of Steve Maddens that were a little over $100 and so stiff that I couldn't help but walk like a robot with no knees as I was testing them out on the department store floor. I ended up buying an absolutely divine pair of black leather Michael Kors knee-high heeled boots instead (which I love), but I've craved the classic riding look ever since. They're the Nine West "Barkin," and are actually cheaper ($149) on the Nine West website than they are on Zappos ($189)! I thought I'd have to order them online since they're a sale item, but I was downright giddy when I spotted them at my local Nine West store today (and laughed out loud when I saw four other women in the store -- no joke -- trying on the same pair). I was, am and always will be a heel girl, but flat riding boots with skinny jeans are one way to get this stiletto aficianado to be happy going heel-less. Plus, these are now my only flat boots; my other four pairs are all high heels. I love these Nine West boots because the leather is a deep, rich chocolate and the texture is supple and soft, which makes them 10 times easier to walk in than those stiff Steve Maddens. It's a high boot, too, so they look very polished hitting right below the knee. I bought these last year at Nordstrom's for over $200, but now they're back with a vengeance -- and on sale -- this year. (Sniff, sniff). The thicker heel is not my thing, but in person the shape of the boot definitely balances any "weight" out on the shoe so the silhouette you get is sleek, feminine and stylish (very Devil's Wear Prada), plus the wing-tip preforation detail is fierce. (Yes, I just went there.) And I love, love, love these boots because they have a 17'' shaft, which means they graze the bottoms of my knees. I say the taller the boot, the better! Have you started boot shopping for the upcoming season? Share your fabulous finds with us! yes yes! i know exactly what u mean! i only wear heels and the only way i won't is if i get a pair of awesome flat knee high boots! i hope i find my pair soon - i think i'll go to nine west to check those out! Those are really cute! I haven't started my boot shopping yet. I too, am more of a heel wearing boot gal, but those flats are very nice. Those MK boots are divine! How narrow is the shaft? I know, aren't they? The MK boots have a 17-inch-high shaft and a 15-inch circumference. Perfect for tucking jeans in to. Oh Lordy. I just talked myself out of laptop shopping for the fifth time this month, and you post this. *drool* Having retired my other boots due to a major discomfort factor, I'm in .... want? Need?? How comfortable are they, really? For walking around, I mean. Revanche: Both pairs of boots are SUPER comfortable. Especially the MK ones (for high heels), because the thicker heel lends more support to your step! I've worn them before from 8am till 9pm on some days.